Tax scams can happen anytime of the year, not just during tax season. However with less than 2 months remaining prior the tax return deadline on October 31st, email scammers are as active as ever. 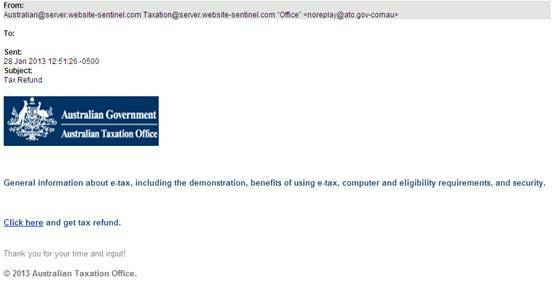 The Australian Taxation Office (ATO) has warned people about official-looking phishing emails that circulate either offering recipients a tax refund if they fill out an online form or claiming a tax refund has failed to process. If you haven't lodge your taxes yet, similar email subject lines have a strong potential to capture your attention. Be careful. Generally, such emails will link to a bogus ATO website asking for your personal and credit card details. As a rule of thumb, none of official Australian institutions, ATO included, will ever send out emails to taxpayers asking them to provide personal information. Other version of the same scam could contain an attachment infected with a virus. Clicking on attached message could infect your computer with malicious software that can monitor web browsing and steal personal information. 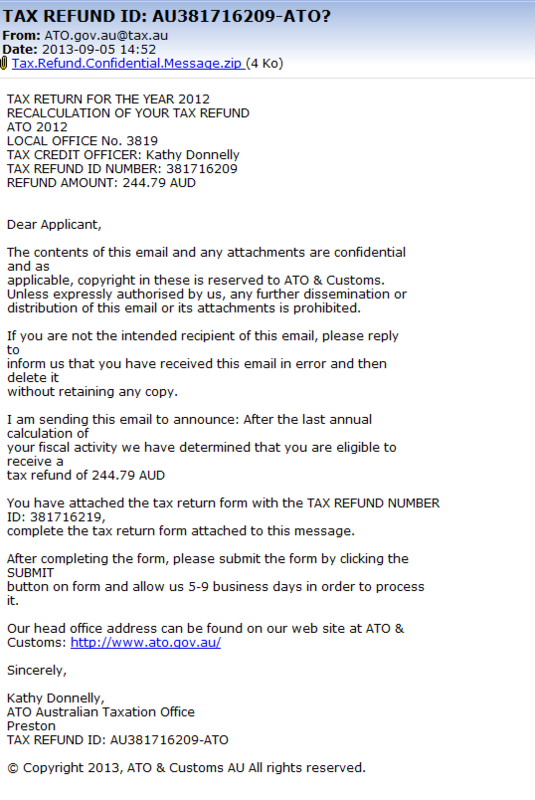 "If you receive an email like this do not open the attachment", the ATO has warned. The latest tax email scam targets people who might have already lodged their taxes for 2012. It claims a credit card number on file is out of date so a refund could not be processed. It then directs you to click on a link which leads to a bogus Australian Government site where your credit card details can be updated. Fake credit card details update form could also ask for other identity information, such as date of birth, mother's maiden name, Medicare or your tax file numbers. Again, don't lower your guard to scams. Under no circumstances ATO will ask you to provide, confirm, update or disclose your personal information via email. Verify if the sender is genuine: email should always come from a valid ATO email address. Have you received any ATO tax scams? Report it to SCAMWatch: scamwatch.gov.au. © 2019 ATO Tax Calculator. All rights reserved.